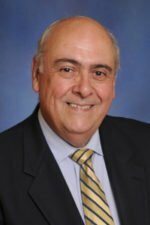 Jorge Marcos, MD is a neurologist with over 25 years of clinical experience in the Miami area, dedicated to improving the quality of life for the elderly and their families. Since early on in his career, he saw a need for the specialized care of seniors and concentrated in this particular group, which led him to an interest in the treatment of memory and movement disorders. Dr. Marcos has conducted numerous lectures and seminars, specially designed to increase awareness of Alzheimer’s disease screening, diagnosis, and treatment especially in the Hispanic community, as well as specializing in the advances in the treatment of Parkinson’s, tremors and other movement disorders. Had served on the advisory board of the Local American Heart Association and South Florida Epilepsy Foundation. He is Vice-President of the Dade County Medical Association and has served as Delegate to the Florida Medical Association Meetings. He is a member of the Academy of Neurology, the Parkinson’s and Movement Disorder Society, American Epilepsy Society, Florida Medical Association and Dade County Medical Association. In addition, he was the recipient of the John H. Jackson Fellowship of the American Epilepsy Foundation for his research on “Seizure Prevention on Stroke”. He has an interest and passion for medical education and has a faculty appointment at the Herbert Wertheim Medical College of Medicine, at Florida International University. Dr. Marcos completed his residency and fellowship in neurology at the University of Miami Medical School / Jackson Memorial Hospital. Jorge Marcos, MD is a neurologist located in Miami, Florida. You can contact his office at (305) 443-2626.